Episode 1 - These Jeans Are Simply Divine! El - a generic word for "god". Originated in 2300BC in the Levantine religion as the name of of the supreme god, who fathered all humankind and all creatures. Gets used in pantheistic religions to refer to the god above all the other gods, and in monotheistic religions as simply "God". Shaddai - coming from the root word "shadad", meaning "to overpower" or "to destroy", "Shaddai" means "destroyer"
Thus, we have "God, the Destroyer". What is "The Metatron"? - An archangel, said to be the highest of all angels and the celestial scribe. Quite commonly Metatron is said to be Enoch himself, who, after being taken to Heaven, was transformed. Having flesh, blood, and eyes of fire and eyelashes of lightning, Metatron is often identified as a "lesser YHVH", and the one closest to God. In fact, in Hewbrew gematria, the words "Metatron" and "El Shaddai" have the same numerical value. 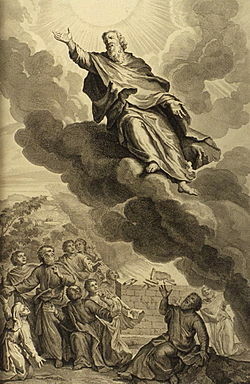 Enoch - At the spry, young age of 365, Enoch was taken to Heaven before his death. His shares this distinction only with Elijah, who was a wizard. According to the 3rd Book of Enoch, upon his arrival in heaven, Enoch is named the guardien of all celestial treaures, the chief of the archangels, and the immediate addendant on God's throne. He is then given all knowledge and sets out to personally fulfil everything God says.